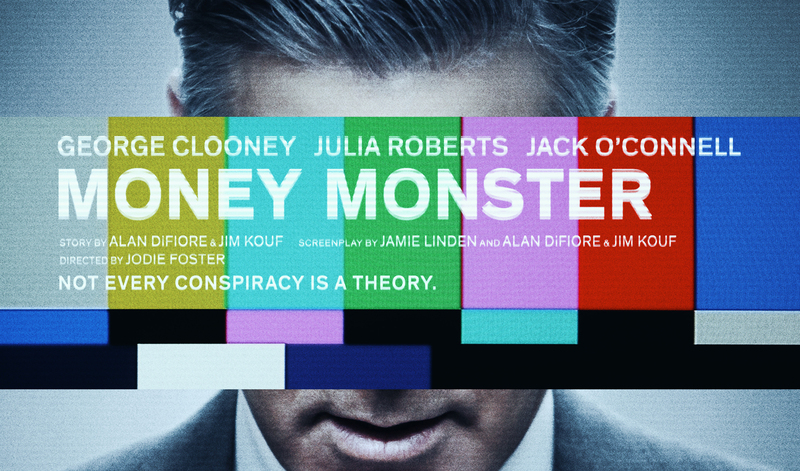 George Clooney plays a financial guru who gives advice to people about the stock exchange on his show ‘Money monster’. Julia Roberts is the director of the show and George repeatedly asks her out for dinner only to be refused by her. George has advised people to invest in a company called IBIS global capital, but suddenly the company loses 800 million dollars due to what is claimed to be a glitch in a trading algorithm. Obviously that is a story not everybody is willing to buy, especially those who have lost money by investing their money on IBIS. One day as George is hosting the show, a man (played by Jack O’ Connell) who has lost his entire life savings on IBIS because he took George’s advice comes disguised as a deliveryman and gatecrashes the show with a gun aimed at George. He seems to be a looney who forces George to wear what he claims are explosives and holds the trigger in his hand. He holds George responsible for his misfortunes and threatens to blow him up. Julia takes charge of the situation and along with George tries to calm the man down. The man has forced the camera to telecast live proceedings of all this and soon the unfolding spectacle is watched by millions. But the CEO of IBIS (played by Dominic West) is nowhere to be seen and he has left his communications officer (played by the svelte Caitriona Balfe ) to answer everything. Caitriona is totally baffled for answers and begins to search for her own answers. All this while the matter has snowballed into a major crisis in the TV studio with the police coming in and planning to take a gunshot at the receiver of the bomb attached to George Clooney, thus potentially threatening his life. And they bring the looney’s girlfriend to try to talk to him but she verbally attacks him so spitefully that the looney is left teetering at the edge of hopelessness in which he could set off the bomb , thus killing everyone in the TV studio. So how will the crisis end? Most importantly , where is the CEO of IBIS and what fraud has he done? As the crisis snowballs into a bigger confrontation, the director (Jodie Foster) does take some cinematic liberty in showing the whole thing escalate from the studio to the streets. The movie is a thriller that does give you some on the spot entertainment as there is never a dull moment in the film. Acting by everyone is decent enough and the sense of crisis keeps looming on throughout the film. But in the end you come out of the theatre feeling that the whole thing was a bit frivolous. Not to be remembered as anything great.